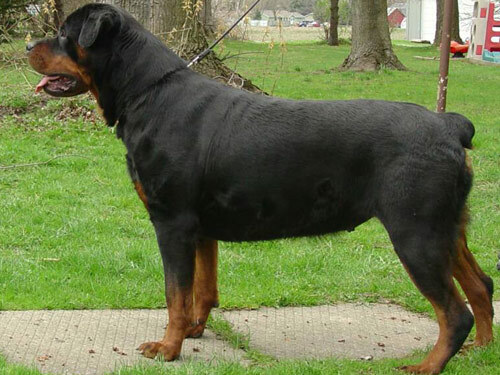 The Rottweiler has a reputation as a breed of protection. This breed is self-assured, brave, and attentive, but has a tendency to be stubborn. Because the Rottweiler is naturally protective, it may be standoffish around people it does not know. It will react with force upon sensing any threat to its owner or family. The Rottweiler is authoritative and dominant and requires a significant amount of social interaction to cultivate these qualities. The Rottweiler requires a significant amount of exercise on a daily basis. These needs can be met with a lengthy walk, a jog, or a high energy play session outdoors in the yard. It is important to train this breed with consistent obedience instruction. The Rottweiler does best in a cool to moderate environment and has the ability to live outdoors in these conditions. As a house pet, the Rottweiler should experience more time indoors to socialize with the family. The coat of this breed needs minimal care, with occasional brushing to remove dead hair. The major health concerns for the Rottweiler are CHD (canine hip Dysplasia), elbow Dysplasia, and osteosarcoma. The minor health concerns for this breed include gastric torsion, hypothyroidism, and allergies. On occasion, PRA (progressive retinal atrophy), cataracts, seizures, vWD (Von Willebrand Disease), panosteitis, entropion, and ectropion are seen. It is suggested that regular testing of the hips, elbows, eyes, and cardiac system occur. The average life span of a healthy Rottweiler is 8 to 11 years. The Rottweiler is believed to have come from the Roman drover dog. These dogs would travel along with Roman troops and keep the cattle moving and safe along the march. One march led these dogs and some individuals to Germany where they remained. The drover dogs persisted in their role as drovers and guardians for livestock for many centuries. These dogs found their way into Rottwell, a town named after the red tile roof Roman baths that were constructed there. This town flourished as a core for the cattle market. These dogs not only protected the cattle, but also the funds earned during cattle sale transactions. These dogs earned the name Rottweiler metzgerhund, or butcher dog, in the town of Rottwell up until the middle of the nineteenth century. Driving cattle became a prohibited activity and the need for the Rottweiler was diminished so vastly that it was almost extinct. A club was formed to attempt to save the Rottweiler, but it did not last. However, the creation of a standard was one of the results of this club. In 1907, a new club was formed that endorsed the Rottweiler as a police dog. In the mean time, another club had formed and the two clubs joined forces to become one in 1921. In 1931, the Rottweiler made its way to America and became recognized by the AKC. This breed quickly gained popularity and by the 1990’s found itself to be the second most popular American breed. The popularity of the Rottweiler has remained since this time, although at a reduced level.